I grew up in rural Eastern Cape (eNgcobo) where kids ran around played with marbles, herded cattles, played games all day and more importantly swam at the river. For some reason I have always been terrified of swimming. After school, my friends would often take off their uniforms and jump into the river and swim. I used to watch with envy as they splashed smiled and some even going under for a couple of minutes. Years later when I moved to East London, my mom would take us to the beach and all I would do is just be at the shore. A visit to the local swimming pool would paralyse my spirit and have me hanging on to the wall for the reminder of the time. 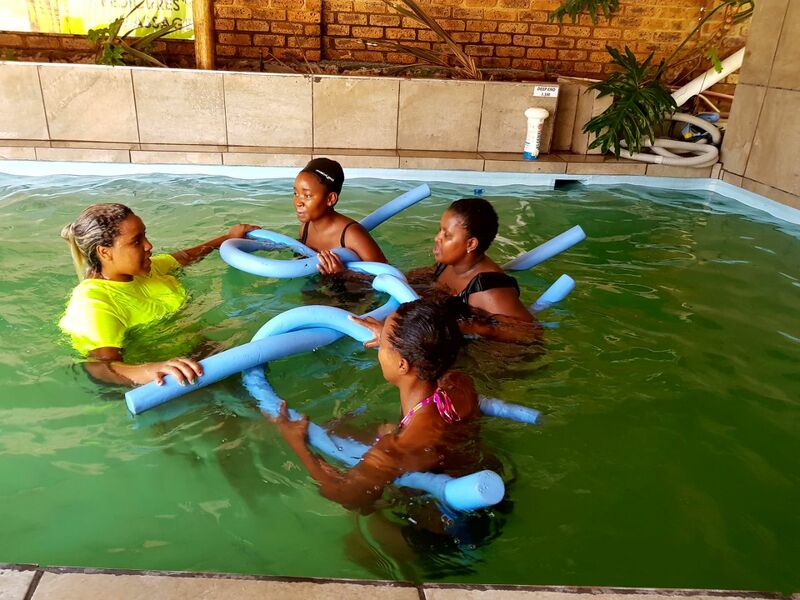 I have spent the last three weekends doing intense adult swimming lessons at Splash Aquademy in Bassonia because well, an adult can learn to swim right? In the last three weeks of intense swimming classes I have learnt about breathing tenchinques, opening my eyes under water, speed, agility, freestyle, recovery, streamlining, floating on my back and front (this requires a super tight core) as well as swimming laps and laps without stopping. I have also had the pleasure of bringing out my inner child in these classes. Tiffany – my swimming teacher often has me humming nursery rhyme – “Ringa ringa roses”, picking up toys from the deep end of the pool and jogging across the pool with multi-coloured balls. The last few sessions have made me to be so comfortable in water. I am not afraid to swim into the deep end because I know I will not drown. I understand how to float, how to recover, breathe under water and do my doggy paddles with eyes wide open. I could go on and on about what these lessons have done for my body, my self esteem and my life but I would rather say that if you are an adult who is terrified of water you need Tiffany in your life. It’s never too late to start and the rewards are great. Splash Aquademy is based in Bassonia, Johannesburg South. You can choose to do 30-minute lessons or you can dive into the deep end and start with hour-long sessions for four weeks. It’s well worth. If you are keen on seeing more of my swimming pictures and videos, please subscribe me on Instagram (@Milirazzi). Don’t forget to follow 🙂 Splash salute!